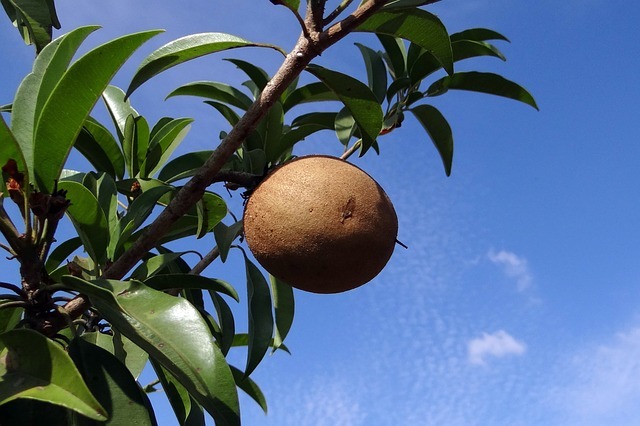 Sapota which is a tropical fruit is also known by many other names like chikoo (called as chiku in some parts of north india), noseberry, lamoot, sapodilla and sapoti. This fruit is tasty and contains a musky flavor. The juice of sapota has many great health benefits and uses which you cannot ignore. Spota juice is rich in anti-oxidants, which helps in fighting against the harmful effects of the free radicals in the body and in their removal from the body. Thus it helps in preventing the formation of fine lines, wrinkles and other signs of ageing on your skin. Sapota juice prevents dry and flaky skin and helps in moisturizing your skin, keeping it hydrated. This is because of the presence of vitamin A and vitamin C in sapota juice. It also aids in the production of collagen, which keeps the skin firm and toned. It also provides more elasticity to the skin and helps in the better recovery. The juice of sapota contains a variety of nutrients that are needed for a healthy and clear skin., like vitamin C, vitamin A and a number of minerals. This improves the texture of your skin and enhances the complexion of the skin. Sapota juice keeps your skin safe from the harmful effects of the pollutants and the UV rays of the sun. Sapota juice can reduce the sunburns caused by sun and prevent the risk of skin cancer. Applying sapota juice on the skin helps in treating skin discoloration, scars, acnes freckles and other such skin problems. Sapota juice is rich in Vitamin C, which keeps the scalp smooth and clean, free from dandruff. As a result the follicle debris is removed and the rate of hair growth is increased. Adrenal fatigue is reversed by sapota juice. This helps in maintaining the proper balance of the hormones and therefore aids in the hair growth. This way sapota juice indirectly helps in the hair growth. By consuming sapota juice regularly, your hair will get all the nutrients that is needed for its proper growth. This provides you a healthy and strong hair, which is also soft and smooth. Your hair becomes more manageable by consuming sapota juice. Sapota juice helps in repairing the blood capillaries and it also increases the blood circulation on your scalp. Consuming sapota juice regularly helps in maintaining the natural color of your hair and prevents premature graying of your hair. So drink spaota juice and maintain a healthy hair. Like other fruit juices sapota is also rich in lots of essential nutrients. It is storehouse of vitamins like vitamin A, B and C and is also a rich source of minerals. Minerals like calcium, iron, niacin, copper and phosphorous are found in large quantities in sapota juice. So having the juice of sapota regularly is good for your health. Sapota juice is a rich source of vitamin C, which greatly improves your immune system. It protects your body from getting attacked by various infectious diseases. It also acts against various free radicals formed in your body and protects you from the harmful effects of these free radicals. Drinking sapota juice everyday protects your body from being infected by bacteria, virus, and other parasites that cause various diseases. Sapota juice is a great energy booster and provides you with instant energy and revitalizes your body. This is because of the high amounts of fructose and sucrose present in sapota juice. So, sapota juice is greatly beneficial for growing children and pregnant ladies as they require high energy. Sapota juice contains a large amount of fibers, as a result of which it acts as an excellent laxative. By drinking sapota juice you are not only saved from constipation, but also from the risks of colon cancer. This is because the fibers prevent the mucous membrane of the colon from getting attacked by various toxins that cause cancer. Vitamin A is found in abundance in sapota juice. As you know, vitamin A is good for your eyes and improves your vision. Vitamin A is also essential for keeping your mucous membrane healthy and for having a healthy and beautiful skin. The risk of lung cancer and cervical cancer is also reduced by vitamin A present in sapota juice. Having sapota juice regularly helps in regulating your body weight and also protects you from diabetes and heart diseases. It also enhances the activities of the intestine. So you can keep a lot of diseases away by having sapota juice. Sopota juice acts as an excellent sedative and helps in keeping the nerves relaxed. It also relieves you from stress and makes you feel at peace. Vitamin B present in high amounts in sapota juice helps in reducing stress and removes fatigue, making you fresh and energetic. Being a rich source of calcium, sapota juice helps in maintaining strong and healthy bones. Sapota juice is a good source of tannins, which are naturally occurring polyphenols. Tannins help in neutralizing acids, which it does by precipitating proteins. Tannins have anti-inflammatory, anti-parasitic, anti-bacterial and anti-viral properties, which keep the body immune from various diseases. The anti-inflammatory properties of chikoo juice are very beneficial in preventing gastritis problems and bowel disorders. Removal of wastes from the stomach is also done by sapota juice. So include sapota juice in your daily diet and see how it benefits you in having a healthy body.